Former Great Lakes Loons pitcher Brock Stewart made his major-league debut for the Los Angeles Dodgers on Wednesday, taking the loss in his team’s 7-0 defeat at the hands of the Milwaukee Brewers. Stewart pitched five innings, giving up five runs on eight hits and two walks while striking out seven batters. He pitched only one ineffective frame, allowing all five runs in the 2nd inning. 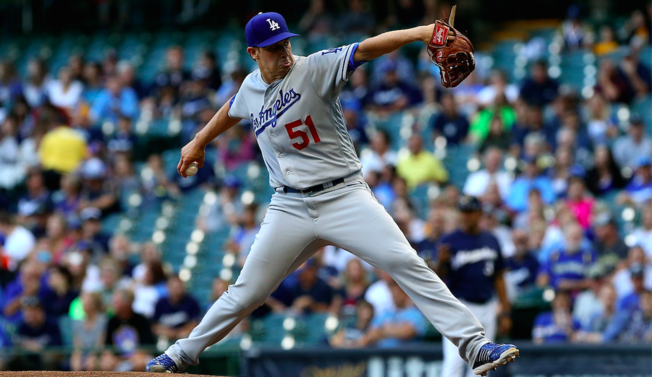 After the game, Dodgers manager Dave Roberts told reporters Stewart will likely get another start at the major-league level rather than be sent back down to Triple-A. Stewart started the 2016 season in High-A, where he made two starts before moving up to Double-A and then Triple-A. He made 14 starts in the minor leagues this season, cumulatively going 8-3 with a 1.47 ERA, 99 strikeouts and 14 walks in 86 innings. The right-hander from Normal, Ill., started the 2015 season in the Midwest League, going 2-2 with a 2.84 ERA, 38 strikeouts and six walks in 38 innings (seven starts) for the Loons before finishing the season with the High-A Rancho Cucamonga Quakes. This entry was posted in California League, Great Lakes Loons, Midwest League, Rancho Cucamonga Quakes. Bookmark the permalink.